How cell cycle is regulated? There are two check points G1/S and G2/M check point. This is where the inspection for any mistake during preparatory phase especially in DNA takes place. Actually two proteins are involved in the regulation of these check points namely cyclins and cyclin dependent kinases (CDKs). As the term indicates, the amount of cyclins oscillates during the cell cycle. 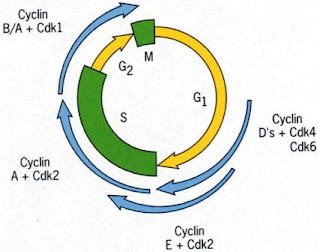 CDK is functional only upon binding to cyclins and its amount remains constant throughout cell cycle. Let us discuss how these two proteins regulate cell cycle. Regulation at G2/M checks point or progression of cell to mitosis? Here cyclin named cyclin B is involved. Cyclin b combines with CDK to form Mitotic-phase promoting factor (MPF). MPF is activated by the addition of phosphate group (phosphorylation) to one of the amino acids of CDK. In short, Cyclin B+ CDK= MPF and MPF+ phosphate= active MPF. In order to understand the process let us check the concentration of cyclin B at different stages of cell cycle. During G1: cyclin B levels are low, so MPF level is also low. In G2 (beginning): cyclin B level gradually increases and this binds with more number of CDKs leading to formation of more number of MPF. In G2 (near the end): active MPF level reaches a critical level, which induces the cell to progress through the G2/M checkpoint to mitosis or cell division. During mitosis: the active MPF (phosphorylated MPF) level reaches maximum. Active MPF brings about the breakdown of nuclear envelope, chromosome condensation and spindle assembly and other events associated with mitosis. At the end of mitotic metaphase: cyclin B level degradation begins resulting in lower amount of active MPF which brings about anaphase, telophase cytokinesis and eventually the cells reenters interphase.In summary, High levels of active MPF stimulate G2/M progression or mitosis whereas low levels favour return to interphase. DNA damage is the major reason that prevents G2M progression by inhibiting MPF. G1/S progression is also similar to the above mechanism except a different cyclin (G1 cyclin) is involved. Defects in cell cycles regulatory machinery is the major reason for many cancers. p53, a tumour suppressor gene is mutated in 75% of all types of cancers and p53 is a CDK inhibitor. In B cell lymphoma G1 cyclin, cyclin D is mutated that lead to unchecked G1S progression. We will discuss the association of cell cycle regulators and cancer later.